Battery doctor power, saving battery power.Youcan use up even more. Saves battery to run longer. It also helps to maintain thebatterydoes not drain quickly from the use of heavy Battery doctorpowerto act and maintain the battery as well. A display of thebatteryand remove applications that use heavy batteries outwell. Energy efficiency of the battery can last more. • Showing the use of batteries. The computation and display the remaining battery time. Add charger system faster so do not waste time so the chargereachtime. Phone Cooler CPU Master is the best programinthe evening.Phone Cooler CPU Master is equipped with a heating system of theCPUbeing overworked. And the machine can be damaged From the useof theCPU is overloaded, for example. Gaming or graphics.Why put too light It is hot, or watch a movie for a long timeforseveral hours, it makes the need for a longer than normal,whichmay lead to more cpu work. So, this is way out of ourwitsphone.• Temperature sensing pharmacist.Supermarket heat detectors Example of high-performance systemswiththe best.• One-touch.Press once, you can drain the speed quickly.• cooling rapidly.A cooling system for the CPU running quickly, saving time fortheuser even more.• thermal protectionThe thermal resistance from the active-duty applicationsandexplains the problems of work. With fixes and improvements• Detection and timer.You can choose the time of the linear function freely.. Battery doctor power, saving battery power.Youcan use up even more.Saves battery to run longer. It also helps to maintain thebatterydoes not drain quickly from the use of heavy Battery doctorpowerto act and maintain the battery as well. A display of thebatteryand remove applications that use heavy batteries outwell.Fong function• Energy SavingEnergy efficiency of the battery can last more.• Showing the use of batteries.The computation and display the remaining battery time.• Eliminate appRemoval may use battery-heavy.• Display the chargerAdd charger system faster so do not waste time so the chargereachtime. Battery DoctorBattery Doctor has everything you need.Best Program battery doctor with power settings to save timeonthe best. The tablet device or your battery. If the battery istoolow, there will be a notification on your device.Description- Fast charging- Memory Boost- Saving battery- Junk Files Cleaner- Cooler phone- EquipmentKey features:- Battery status and time remaining.- Show the charging time remaining.- Increasing energy efficiency, batteries, smart of you.- Optimized for energy-saving manner.- Identify and disable background running apps, thebatterylasts.- Control the brightness of the screen.- Monitoring the efficiency of energy use.- Details and battery temperature.- Saving battery life and smaller package withpowerfulfeatures.Battery Doctor is a simple and easy as possible toAndrew'swaiting for you when you need to work effectively. The Best Battery Doctor application offersthebest power settings to save time on your device or tabletbattery.If the battery is low or too low, press Economy ModeApplication toenable Economy mode.With battery saver, you can turn off all additional features onyourdevice, such as Wi-Fi, Bluetooth, GPS, sound, and otherenergyapplications. The app alerts you.Charging phase:Free Ultimate Battery Doctor Apps regulate how your device isloadedinto a unique three-stage charging system that reminds younot toexaggerate to make the most of your battery.Key Features:- Accurate battery remaining time- Display timeout.- Exact residual load- Schedule sleep mode for work / class / sleep!- 3 steps 1. Charge system fast charge, 2. Continuous load, load3.epilepsy.- Wi-Fi / data / Bluetooth / GPS mode / Vol fluctuation!- Brightness adjustment!- Batteries, batteries mAH Displays current, temperature,voltageand battery status. battery saver - fast charger is a FREEbatterysaving app that makes your battery last longer, and can helpyouget up to 40% more battery life for your Android phone!.Withbattery saver - fast charger smart pre-set battery powermanagementmodes, Our special one-tap optimization featurestopspower-consuming apps with a single tap.Start using battery saver - fast charger today and take yourphonewherever you like without thinking about this old, shortlastingbattery.Feature list:fast battery chargerbattery charger 2017super fast batterybatterychargingfastchargerSave Power Shortcut which kills tasks with one tap! *************Kill apps when screen is off! *************wifi,Data,Bluetooth Switch*************Accurate battery life remaining time! *************Accurate charging time remaining! *************brightness control*************Wi-Fi/Data/Bluetooth toggles! *************Brightness control! *************easy to use interface*************unique 3,step recharging system*************Smart charging tips! *************Simple easy-to-use interface! *************tips for Smart Charging*************Supported languages*************Really simple interface made for everyone. *************Use Repair battery saver - fast charger every weekandboost your battery duration. *************Use Repair battery saver connected with ourotherBattery tools to share information and make your battery lastevenbetter.- Top notch support. We hear our customers! *************Supports most of devices:*************Samsung Galaxy S2, S3, S4, S5*************Samsung Galaxy S6*************Samsung Galaxy S7*************Samsung Galaxy A4, A5, A6, A7, A8*************Samsung Galaxy J5, J7, Grand Prime, Core, Ace 4*************HTC One M7, One M8, One M9*************HTC Desire X, Z, HD*************LG G5, G4, LG, G2, G3, Nexus*************Sony Xperia X, Z5, Z4, Z3, M2, M3, M4, M5, XA, Z3+,Z3Compact*************Xiaomi, Nexus, OnePlus, Asus, Huawei, Motorola*************HTC Desire 610*************LG Optimus L5 II*************LG Optimus L9*************LG D855 G3*************Samsung GT-I8190N Galaxy S III Min*************Free*************Quick launch*************Unique design*************kills tasks when the screen goes out*************accurate remaining battery time*************precise estimate of remaining load*************energy saving mode planners for work,class,sleepandmore*************battery temperatureTry it now ! It's simply the best at what it does. ★★ Battery Doctor - Battery Saver -FastCharger ⬆️ 🔋 ★★★ Dr. 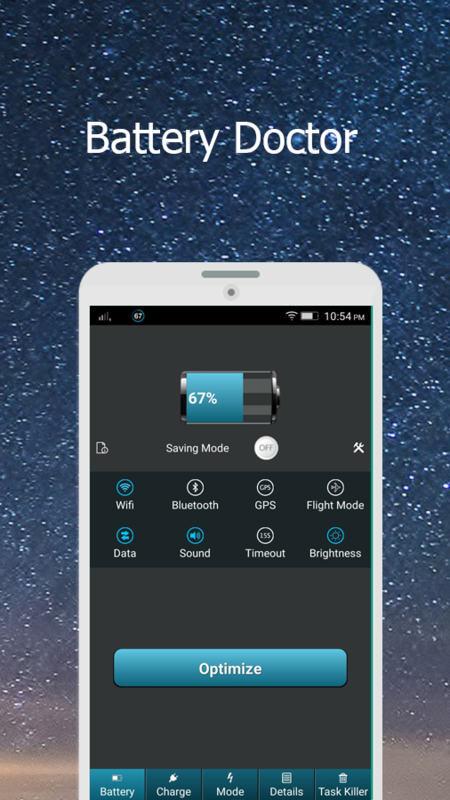 Battery - Fast Charger is a FREE Battery app thatcanCharger Faster your phone 30% and extend your Battery life upto50% by finding apps and settings that drain power onyourdevice.★ Battery Doctor is a FREE Battery saving app. Our special1-tapoptimization feature stops power-consuming apps with asingletap.★ Fast Charger Battery is an ultimate tool, which can boostyourBattery charging speed by 20-40%.★ This app will automatically activate when you connectyourCharger and it will boost your charging speed.★ Battery Doctor - Battery Saver - Fast Charger is themostefficient and professional Android power booster. BatteryDoctor -Battery Saver helps user to save Battery life just in asingle Tapwhenever it starts trickle.★ Battery Doctor - Battery Saver - Fast Charger lets yourechargeyour device with absolute ease and comfort unlike anyother similarapplication.★ This smart Battery optimizer gives your phone the abilitytoenable settings for killing background running appswhilefunctioning as Memory Cleaner, Ram Booster, and Task Killerfor abetter Battery performance.★★ How Fast Charging works : ★★➫ When you connect your Charger, Fast Charger Battery willdetectit and limit the power consumption of yourphone/tablet.➫ Then your Battery doesn’t withdraw much power during thechargingtime and therefore it can charge very quickly.➫ According to our tests, this will reduce your charging timeby20%-40% (depends on the device)♦ The application is FREE forever !! !♦ You can save Battery life up to 2x - 4x more to boostyourphone get along a lot more Faster.♦ Super Fast Charger 5x not only improve the speed ofcharging,but also enhance your Battery life.♦ Top Battery Doctor - Battery Saver - Fast ChargerFeatures:★ 1-tap Power OptimizationJust 1 tap will stop the power-draining apps from running★ Fast Charging➫ Monitor Charging status★ Full Control of Power-draining Apps➫ Find out what’s draining your power and selectively stop thetoppower-consuming apps★ Battery saver➫ Discover how long your Battery will last under a varietyofsituations (playing games, Wi-Fi (active), etc. 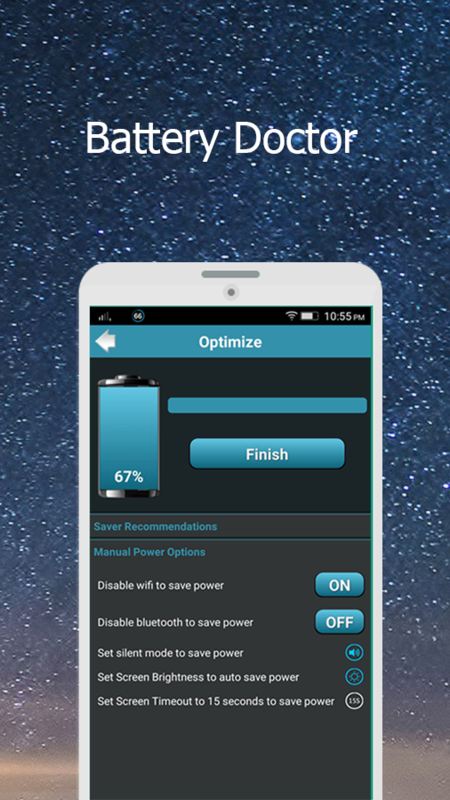 )★ Convenient Power-Saving Widget➫ Quick access to power related system settings (Wi-Fi,data,brightness, etc. )★ Clean Junk Files➫ Smart Clean helps to delete cache files, residual junk filestoreclaim storage. Improve the performance of your device.★ Phone Cooler➫ It monitors your phone’s temperature in real time andanalyzeswhich apps are causing the overheating.★★ Feature list: ★★• Save Power Shortcut which kills tasks with one tap .• Kill apps when screen is off .• Accurate Battery remaining time .• Accurate charging time remaining .• Smart Battery consumption optimization with just One-Tap .• One tap optimizer with active task killer Battery widget tosavefor optimal power consumption .• Adaptive power saving mode with options for custom orsmartpre-set Battery saving modes .• Identifies and disables background running, Battery hoggingapps.• Pre-set saving modes: normal / save / Extra Save .• Wi-Fi/Data/Bluetooth toggles!• Brightness control!• Battery temperature!• Smart charging tips!• Efficient monitoring of power usage• Displays details: Battery temperature, Battery voltage,Batteryhealth• Simple and Minimalistic interface for effectivepowermanagement• Kills unnecessary tasks with extremely simple one-tapOptimizebutton to save more.• Easy Battery saving and effective small size packagewithextensive features• Battery Saver.• Battery Doctor.• Fast Charger.• Kill process.• Notification when full Battery.• Fast Charger Battery is free app.♦ Please contact us if you encounter any difficulty!thankyou!♦ Don't forget best wishes with Battery Doctor - Battery Saver-Fast Charger.♦ What are you waiting for ! download it now !Thank You . Battery doctor (battery repair) is a FREEappthat extends the battery life of your phone or tablet by up to50%!Smart Battery Management, One Touch Controls and FeaturesFromhealthy load to diff. Levels, Battery doctor (repairbattery)solves the problem. Gives a longer life to your Androidphone,provides you with detailed information about the battery andallowsyou to charge healthily through our unique 3-step chargingsystem.More users around the world have adopted Battery doctor(repairbattery).Highlights of Battery doctor (repair battery):✔ Fast battery saver:Convenient battery economy - with the "OPTIMIZER" homescreenwidget, stop power-hungry background apps with one clickandincrease the life of your battery.✔ Simple Battery Saver:Predefined Intelligent Modes - select the mode that best suitsyourconso. Energy, personalize it to find the right balancebetweenperformance and bat life. Thanks to our battery saver.✔ Effective battery saver:Sound loading manager - follows and implements charging practicesatdifferent levels for optimal performance of your battery.Accurate state - its intelligent technology tells you the exacttimeremaining charge and provides you with a detailed analysis ofyourhardware and your Android apps.☆ Intelligent chargingBattery Doctor will help you optimize the loading process.Many charging modes: Battery Doctor gives 2 modes, includingSuperSaver mode and Sleep mode. You can choose a mode or customtooptimize the loading of your Android device.☆ Save battery powerIs a FREE battery saving application that makes your batterylongerand can help you get up to 50% more battery life for yourAndroidphone!Battery doctor is the easiest solution to ensure optimalfunctioningof your Android phone, but also to avoid inefficientrecharges,unwanted power consumption by some applications, anddisruption ofdevice settings Reduce the battery life. Dou you want to boost battery charging speed for your androiddevices?Do you want to save battery life for your smartphone ortablet?Do you want to optimize consumption of battery for yourdevices?If your answer is YES, Battery Doctor - Fast Charging is awonderful tool that is born for you. Battery Doctor - Fast Chargingcan boost charging speed, save battery life and optimizeconsumption of battery for your tablets or smartphones. WithBattery Doctor - Fast Charging, you have more time to use yourdevices. No sooner do you install Battery Doctor - Fast Chargingthan you do not worry about the battery life problem.FEATURES☆Boost battery charging speed 1.5 timesBattery Doctor - FastCharging is developed base on the newest and modernist batteryalgorithms and intergrate “fast charging 3.0 technology”. Theunique algorithms and technology will analyze battery situation andinformation of your device’s system, then give the best solution toboost charging speed for your devices. Thanks to Battery Doctor -Fast Charging, charging battery speed of your smartphone willincrease 1.5 times.☆ save battery life and optimize consumption ofbatteryBattery Doctor - Fast Charging will analyze consumption ofbattery of your devices and then recommend the best solutionsuitable for your devices. In addition, the app gives many optionsincluding turn on/off wifi connection, 3G, 4G, LTE, GPS, bluetoothor decrease brightness, close unnecessary applications runningunder background... in order to reduce consumption of battery andsave battery for your devices.☆ simple and easy to useBatteryDoctor - Fast Charging is designed simple and easy to use. 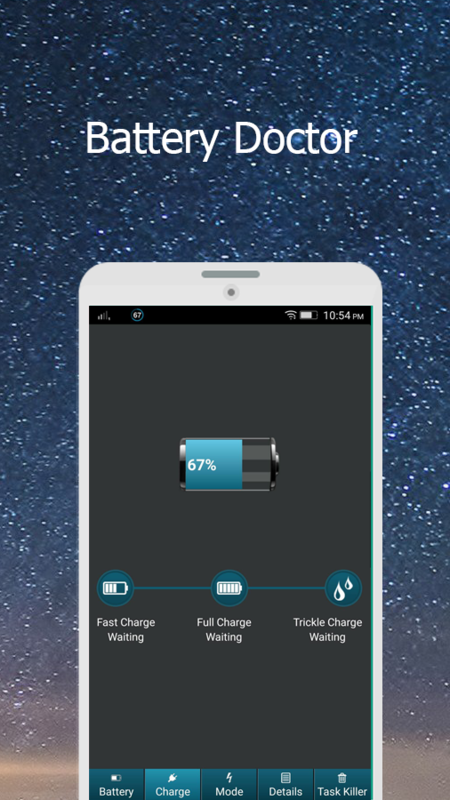 Withevery feature, you can use 1 click, and then Battery Doctor - FastCharging will solve all problems automatically. Super fast, simpleand easy to use.SUPPORTSIf you have any problems while installingor using the app, please contact our apps developer team at email:[email protected] will contact with you and solvethe difficulties as soon as possible.If you like the app, pleasehelp me rate 5 star. Thanks. Battery Doctor 2017 Pro isfreeapplication.If your android phone draining so fast ! if you have problemwithyour battery ! your phone battery dies so fast ! thisapplicationwill helps you!with this amazingBattery Doctor 2017 application for android youcanprolong the battery life up to 50%, believe me you need to tryit.you are beautiful theme and lovely color.Battery Doctor 2017 lets you charge your mobile device with easeandcomfort. 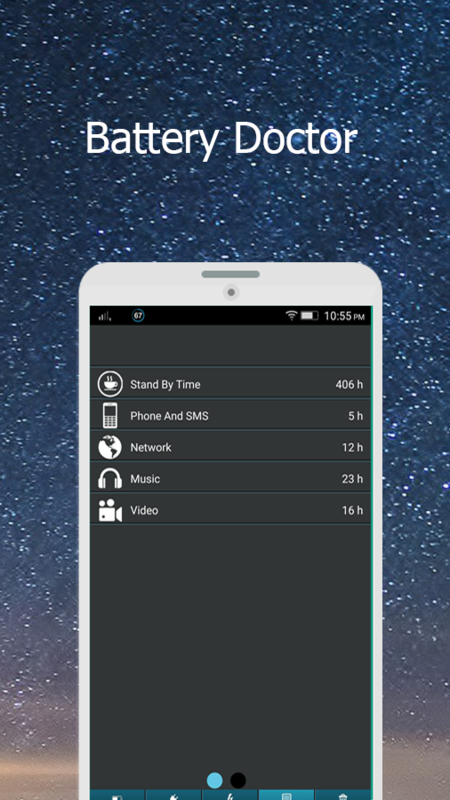 It examines all those services that drain out thebatterylike auto sync, bluetooth, GPS, Wi-Fi, NFC, mobile data,high screenbrightness, Screen timeout etc. and turns them off whenneeded. Andmode lets your Smart-Device battery charged in lessthan 20-40%. oftime as compared with the normal charge timings andextend thebattery life.Battery Doctor 2017 Pro is a FREE BATTERY saving app thathelpsextend your battery life up to 60% by finding apps andsettingsthat drain power on your device And boost your chargingspeed.Battery Doctor 2017 Pro Automatically activate when youconnectyour charger with your device and it will boost yourchargingfast.Battery Doctor 2017 Pro extends your battery time and help toboostyour charging Battery and charge it fast and itsautomaticallyactivate when you connect your charger in your phoneandroid .. Nowyou can have a quick meal and have your device fullycharged whenyou’re done.and you nedd to know is freeapplication.MAIN CHARACTERISTICS :is free applicationBrightness control.Easy to use interface.Wifi on / data / Bluetooth.Compatible with all device android.prolong the battery life.Shows the battery stastatistique in the application Foryourphone.Work in background.Faster Charging Speed Up > 50%it will boost your charging x3.Shows the battery capacity in the app .. batterymonitorwidget.Automatically activated fast charging mode.Tips for rechargingYou can also manually turn on or off the services youwishindividuallyBattery temperature.Shows the status of battery life and usage.Fast Charging Automatically activate when you connectyourcharger.not only its speedy fast charging reduces charging time butalsoextends the battery time.closes all services that actually consume the battery quickly bythehelp of just a single tap on a screenFEATURES FOR MODES.- Battery Saving Mode.- Battery Sleep Modes.- Battery Customized Mode.what are you waiting for .. download it now It's FREE InGOOGLEPLAY.Enjoy with Battery Doctor 2017 Best Application For yourAndroidphone.